New Providence, New Jersey, U.S.
McCarthy has received critical acclaim for his writing/direction work for the independent films The Station Agent (2003), The Visitor (2007), Win Win (2011), and Spotlight (2015), the last of which won the Academy Award for Best Picture, won McCarthy the Academy Award for Best Original Screenplay, as well as a nomination for the Academy Award for Best Director. Additionally, McCarthy co-wrote the film Up (2009) with Bob Peterson and Pete Docter, for which they received an Academy Award nomination for Best Original Screenplay. McCarthy also wrote the film Million Dollar Arm (2014) and served as a director and executive producer for the Netflix television series 13 Reasons Why (2017). McCarthy was raised in New Providence, New Jersey, one of five children of Carol and Eugene F. "Gene" McCarthy; Gene worked in the textile industry. McCarthy was raised Catholic, in a family of Irish descent. 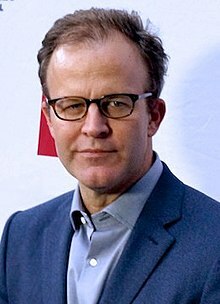 McCarthy is a graduate of New Providence High School in New Providence, New Jersey; Boston College, Class of 1988, where he was a member of the improv comedy troupe My Mother's Fleabag; and the Yale School of Drama, where he studied under Earle R. Gister. McCarthy spent several years doing stand-up comedy and theater in Minneapolis and Chicago before going into television and film. He starred in Flags of Our Fathers as James Bradley and the final season of The Wire as the morally challenged reporter Scott Templeton. He made his Broadway debut in the 2001 revival of Noises Off! McCarthy's directorial debut, The Station Agent, which he also wrote, won the Audience Award and the Waldo Salt Screenwriting Award at the 2003 Sundance Film Festival. The film also won the BAFTA Award for Best Original Screenplay and the Independent Spirit Award for Best First Screenplay and the Independent Spirit John Cassavetes Award. The Station Agent also won awards at film festivals ranging from San Sebastian to Stockholm, Mexico City, and Aspen. He also co-wrote and directed 2011's Win Win based on his experiences as a wrestler at New Providence High School. McCarthy's most recent film, the independent drama film Spotlight, received widespread acclaim following its release in 2015. The film received 6 Academy Awards nominations, 3 Golden Globe Awards nominations, 2 Screen Actors Guild Awards nominations, and 8 Critics' Choice Movie Awards nominations. McCarthy directed the first two episodes of 13 Reasons Why, from Anonymous Content and Paramount Television. The show is based on the 2007 New York Times bestselling YA book by Jay Asher. 2011 Yes Consulting producer, Episode: "Winter Is Coming"
^ "Thomas McCarthy Biography ((?)-)". ^ Jessica Iredale. "Boys' Night Out With Tom McCarthy". WWD. ^ "Thomas McCarthy on His First Cast". Wall Street Journal. 18 March 2015. ^ "Obituary: Eugene F. McCarthy of New Providence". Independent Press. NJ.com. March 25, 2013. ^ Hoby, Hermione (May 20, 2011). "The 'man strength' behind Win Win's Thomas McCarthy". The Guardian. ^ "Tom McCarthy Speaks About Opening 'Spotlight' In Catholic Italy, How He Cast Michael Keaton, And How Journalism Is Deteriorating". Variety. September 3, 2015. ^ "The Heights 4 November 2003 — Boston College". newspapers.bc.edu. Retrieved 2017-02-27. ^ "Five Yalies nominated for Academy Awards; two take home the prize". yale.edu. March 2, 2016. ^ "'Spotlight' writer-director Tom McCarthy on his time as a Chicago theater actor". Chicago Tribune. November 10, 2015. ^ Wiltz, Teresa (September 3, 2001). "Down to "The Wire": It's a Wrap for Gritty TV Series". The Washington Post. Retrieved 2007-09-03. ^ "The Station Agent – Awards". Retrieved 2008-03-14. ^ Siegel, Tatiana (2009-02-23). "'The Wrestler' tops Spirit Awards". Variety. Retrieved 2009-04-02. ^ "HBO: The Wire: Inside". HBO. ^ Angelo, Megan. "Just Like the Good Old Days in the Ring", The New York Times, March 18, 2011. Accessed July 25, 2012. ""I just called Joe and said, ‘Let’s develop a movie based on New Providence wrestling,’ " Mr. McCarthy said.... Because of tax credits, they shot on Long Island rather than in New Providence. But they scouted locations tirelessly, most notably the office and home that Mr. Giamatti’s character shuttles between.... Though the locations might have been fudged, the filmmakers kept New Providence High School in the film by using its banners, uniforms and wrestling mats, an effort facilitated by one of their former classmates, who’s now the school’s principal." ^ Andreeva, Nellie. , "Deadline", February 25, 2016. Accessed July 16, 2016. ^ McNary, Dave. "'Spotlight's' Tom McCarthy to Re-Write Disney's Live-Action 'Christopher Robin'". Variety. Retrieved 2 March 2017. ^ Havan_IronOak (3 November 1996). "Mary & Tim (TV Movie 1996)". IMDb. Wikimedia Commons has media related to Tom McCarthy.